While there are books about folk dances from individual countries or regions, there isn’t a single comprehensive book on folk dances across the globe. This illustrated compendium offers the student, teacher, choreographer, historian, media critic, ethnographer, and general reader an overview of the evolution and social and religious significance of folk dance. Mary Ellen Snodgrass taught high school and university classes for 23 years and served as a state humanities lecturer and member of the NC Library Commission. She is the author of several works of award-winning reference volumes including Japan vs. U.S.A. (1993), Encyclopedia of Feminist Literature (2006), Encyclopedia of Utopian Literature (1995), Encyclopedia of Fable (1998), Encyclopedia of the Underground Railroad (2007), Encyclopedia of Clothing and Fashion (2013), and The Encyclopedia of World Ballet (Rowman & Littlefield, 2015). 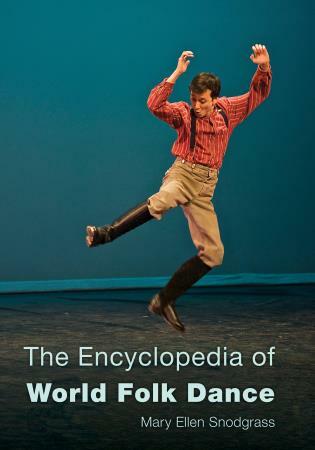 This encyclopedia must have been a challenge for prolific compiler Snodgrass, covering as it does such an expansive topic—folk dance worldwide from all time periods. Each entry, however, offers sufficient detail to serve as an good introduction for students and more advanced researchers. One of the best features of the work is the explanation of terms used to describe individual dance practices, customs, and change over time; there is also a separate, helpful glossary of terms. An illustrative example would be the polka, also known by the Polish krakowiak. The author provides historical perspective on this dance and how it varies in different periods and parts of the world (e.g., its Scandinavian version gammeldans). Each entry has the source of the information listed, often derived from primary resources. The bibliography includes both primary works and secondary books and articles, and there is an appendix of state and national dances. The author provides a chronology covering 5000 BC to 2016—an interesting feature, but lacking sufficient detail for most research needs. The work's exhaustive index, on the other hand, is especially important for interrelating topics (e.g., under ‘Jewish dance,’ one can find the two-page main entry bolded, with multiple mentions in other entries and pointers to five unique Jewish subgroups). Summing Up: Recommended. All readership levels. Snodgrass examines 'the placement of folk dances within world history' in this useful reference. Each entry cites its source(s) at the end. Some summaries place folk dance within a subject, as in 'Art, Folk Dance In' or 'Film, Folk Dance In.' Examples of dances mentioned include the czardas, the mazurka, the polonaise, the Highland fling, and the hula as well as Native American dances such as the sun dance and the ghost dance. There are general entries ('Greek Dance'; 'Jewish Dance'), along with more intriguing ones (e.g., 'Dragon Dance'; 'Parasol Dance'). Rituals—coming-of-age, nuptials—are covered as well. Shamanic dance, worship dance, and sacrificial dance give yet additional perspectives on movement as ceremony. This resource is noteworthy for its interweaving of dances with information on their respective countries/cultures and their purposes and meanings. Students doing reports will benefit from the helpful bibliography, which separates primary and secondary sources, and from the glossary and chronology. Color and black-and-white photographs provide examples. Often one has to research a country to find out more about its traditions, but this book offers an overview that is subject specific, making it a strong option for those seeking folk dance materials. Verdict: An excellent introduction for anyone looking for information on world folk dance and its terminology. The Encyclopedia of World Folk Dance spans the globe to provide a comprehensive, single-source exploration of multiple aspects of folk dance. . . .Overall, the encyclopedia is a user-friendly resource. . . .A notable strength of this resource is its global perspective; folk dances from around the world are considered in terms of their relationships to each other. This informative, well-researched encyclopedia will meet the needs of students, teachers, and historians and would be a welcome addition to academic or large public libraries. The encyclopaedia begins with a chronology, before 347 pages on an alphabetical series of subjects ranging from nationalities to dance form (e.g. veiled dance, clogging or branle), taking in other topics as wide-ranging as censorship and ceilidhs. A brief appendix lists national and state dances, alphabetically by dance rather than by nation. This is followed by a four-page glossary of necessary terms that might be unfamiliar to the average enquirer, such as ‘bel canto’ – a singing style – or the act of ‘reverence’ made to spectators at the end of certain dances. There is an eight-page bibliography divided into primary and secondary sources: books, journals and electronic sources; the vast majority of the secondary sources were published in the past 15 years. A very detailed index finishes off the book. Additionally, the book is well-supplied with both black and white and eye-catching colour illustrations…. The book is undoubtedly of value.